PG-13 | Intense sequences of action including frenetic gun violence throughout, brief strong language, sensuality and some drug material. 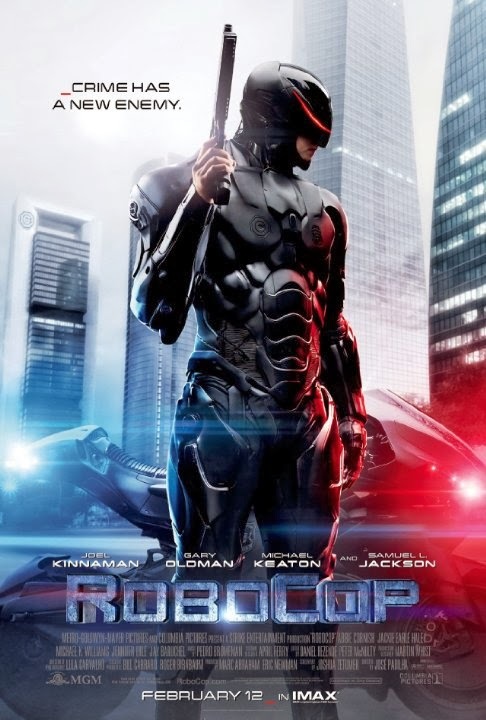 Joel Kinnaman as Alex Murphy, a police detective who is injured in an explosion and transformed into the cyborg RoboCop. Gary Oldman as Dr. Dennett Norton, Chief Scientist Omni Foundation who creates RoboCop. Michael Keaton as Raymond Sellars, the villainous CEO of OmniCorp. Samuel L. Jackson as Patrick "Pat" Novak, host of The Novak Element and prominent supporter of mechanized crime control. Abbie Cornish as Clara Murphy, Alex's wife. Jackie Earle Haley as Rick Mattox, a military tactician responsible for training RoboCop. Michael K. Williams as Jack Lewis, Alex's former partner. Jennifer Ehle as Liz Kline, the head of OmniCorp legal affairs. Jay Baruchel as Tom Pope, the head of marketing for OmniCorp. Aimee Garcia as Jae Kim, a scientist who works with Dr. Dennett Norton. John Paul Ruttan as David Murphy, Alex and Clara's son. Marianne Jean-Baptiste as Karen Dean, Detroit Chief of Police. Douglas Urbanski as Mayor Durant, the Mayor of Detroit. 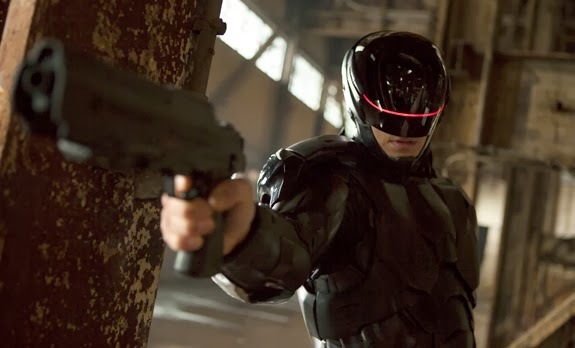 The latest reboot of 1980s movies Robocop goes by the motto if it ain't broken don't fix it. Director José Padilha making only slight changes from the original, unfortunately makes a solid but also unimaginative remake of the original film. A great cast including Laurence Fishburne, I mean Samuel Jackson and shoot up action makes this worth watching. The original came out in 1987 and captivated me back then with the mechanized drones that is reminiscence of the Robotech droids but in live action! With a cop wronged by the corrupted corporations and betrayed by his fellow officers, this was a captivating story then as it is now. Especially when the cop, Alex Murphy, played this time around by Joel Kinnaman comes back as a cyborg with amazing killing abilities. So what if he's not totally in control right? Joel Kinnaman does a great job at showing emotion or rather lack of it when only his face is featured in the film. Gary Oldman and Michael Keaton are excellent as well as the scientist or father of Robocop and the evil head of OmniCorp respectively. Overall, I would recommend this film, as the fight scene between Robocop and the drones alone are worth the price of admission. But there's definitely enough tweaks from the original that will have you going, "oh that's new." I would have still love to see more new technology being as how the movie is set in the future. Like new designs for the drones, more variety. Changing the suit from silver to black doesn't really count for me. Did you enjoy it?